Click on the image here to watch my video for Livestrong.com on how to forearm stand in yoga with Michael Guiou. I’m Kiki Flynn here and this is how to do a forearm stand in yoga. We can bridge headstand to the very difficult handstand by learning the forearm stand and develop superior core and incredible balance. Forearm stand requires incredible pelvic and core strength and what we call in yoga waist strength. So when we take this yoga boat pose, we can understand if we have the strength to move towards forearm stand. If you are not able to do this, please don’t do forearm stand. We see these firm legs, strong arms, steady gaze, breathing through the nose and holding the spine and pelvis upright, lift, lift, lift. And we’re going to move to headstand, part 2. We place the forearm and hands very firmly. The hands are actually embracing the head. This was a very good movement that he made here with the shoulders. Let’s move the legs to a kind of a downward dog type position. Stay here, we can see that this is like our yoga boat pose but inverted. We see the same strength in this area and let these shoulders widen as the elbows dig down with an inhalation, two legs float up with this incredible overall core and tone. We are firming the legs, firming the buttocks, everything is strong and active and there’s a quality that we are reaching up, up as though the feet could go a half inch higher in the room. If you think you are going to fall, quickly come down, don’t fall out of this pose. We’re going to see if he can lift his head up here off the floor, then he’s ready for forearm stand. Inhale, up, up, up and I think we have the core that we need. Exhale gently down, don’t rush this and with another exhale, slowly return to the starting position. 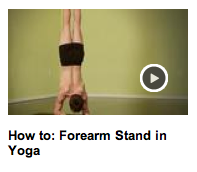 Let’s look at forearm stand. These forearms and hands are pressing flat like big firm feet, one inhale and let’s go up and squeeze and here we are toning, firming, let’s see the shoulders rise and widen as the hands press down and very nice with control, we’re going to exhale back down to the floor and just rest for a minute.